Here are some of the logos submitted to the Japanese trademark office, the one on the right was the one they used in the end. You can see these here, you need to first click the “Japanese Trademark Database” link, then type “mother” into the search box and then hit the “SEARCH” button, then hit the “INDEX” button. It looks like there’s a revised trademark (and possibly logo) that was submitted in 2005 too. I didn’t do a thorough look, so maybe there’s more. NOA filed for the name “Mother”, which you can see here. 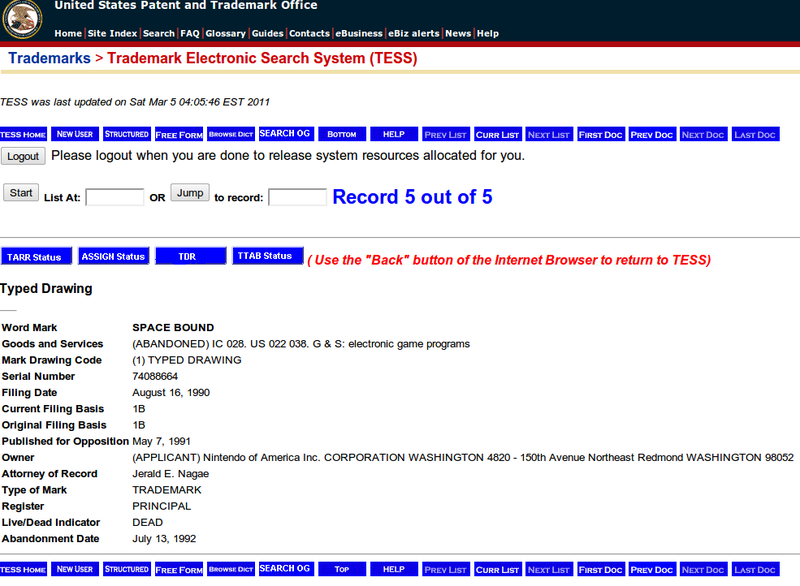 NOA also filed for the name “Space Bound”, which you can see here. And then there’s NOA’s filing for the name “Earth Bound”, which you can see here. You can find these on the USPTO site here. There might be even more stuff of interest, so check it out sometime! There’s also more info about all this stuff in this old forum thread, but I don’t think I was able to salvage all the pics/info from there. I also seem to recall other logos being discovered, so if you happen to remember what I’m talking about or if you come across any more info, lemme know! …that would have been weird. I really like that ufo logo on the left, but in the end, I think the logo with the earth fits the series better. Heehee, that alternate MOTHER logo’s quite cute, though I definitely prefer the “actual” one. I think I like the Earth motif over the space one, personally. The little UFO is pretty cute, though! Although there is no revised logo. It’s just a simple font saying Earth Bound. It doesn’t even say that nintendo copyrighted it, so it may be something else entirely. Ha! The one on the left is something I would expect NOA to use. It just looks to quirky for a deep game like mother even though mother is very quirky. Kinda looks like a logo for Star Tropics, I like it. I like the earthy one too. This makes me want to start some sort of contest where we come up with alt logos for the game 🙂 I think it would be fun! ^ Oops, I mean, the link to the Japanese patent office isn’t working. For some reason a number is generated for that URL on the page that leads to the search page, perhaps to allow for tracking results. Without that number, it won’t work. Go to the following page and click the first link under the Trademark section to get to that search page with a generated number. I like these original trademark logos so much that I used them for my phone’s backgrounds. I used the one with the lil’ ufo as my lock screen and the second for my home screen. “Unrecoverable system error has occurred. @JFDP13 I think that the website doesn’t use url’s, so if I copied and pasted the link, it wouldn’t lead you to it. You can still access it by searching for Earth Bound. It is the only search result on the list. There isn’t really any logo. It’s just the same as other items in the trademark office that don’t have any designated logo. It’s written out in arial font. I like the little UFO in front of the Mother logo. But to me, it makes more sense to have the earth one. Hey, I know this is unrelated to this forum but, is Itoi-san safe from the earthquake? I just heard confirmation that Itoi is safe. He says that he’s thankful for everyone’s concern and that he’s confirmed that everyone that works in his office is safe. I hope that the nuclear reactor doesn’t blow up either. The Japanese are getting hit hard right now. 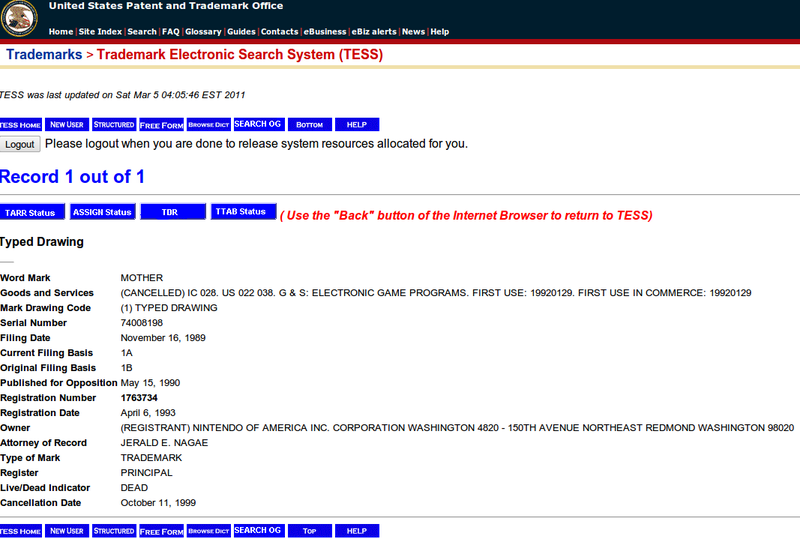 Out of curiosity, how come NOA’s EarthBound trademark says it’s DEAD and was abandoned on July 13, 1992? Is it because it was planned for Mother 1 and they had to cancel/reapply for the trademark later when Mother 2 came out? 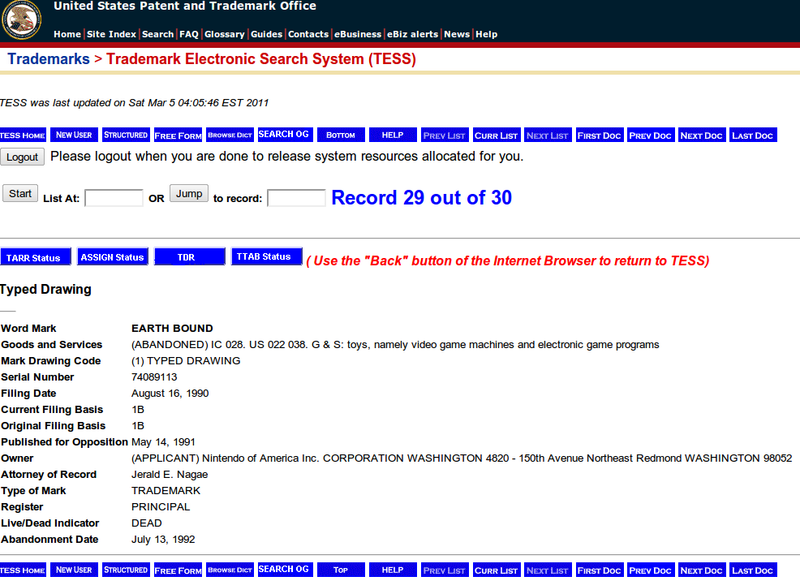 @Nimbus – note the space between “earth” and “bound” in that abandoned trademark. The game we all know and love does not have a space there. Tiny details like that make a big difference in the legal world. Were Not Talking ‘Bout The Eminem Song? Forget The Copy Into Adress Bar Bit! Space bound makes no sense, glad they chose EB over it. I guess they thought of “SpaceBound” since you’re fighting aliens, but you never go to space. Then again, I don’t think you’re technically “EarthBound”, either, seeing as how you go Moonside, Magicant, and the Lost Underworld. But all in all, the names make as much sense as “Mother” does. I have a theory for why EarthBound is called that. Now, as everyone knows, the name EarthBound comes from Earth Bound, which is what Mother 1 was going to be localized as. but where did the team that worked on Mother 1’s localization get the idea from? Well, I think they decided Mother was too girly sounding of a title for a game, so they figured they’d change the title to something American gamers won’t be off put by. So they figured since the goal of the game iis to defeat an alien, they’d cal it Space Bound. But then, they realized you never actually go into space, so they changed it to Earth Bound, since they characters remain bound to the earth for the entirety of the game. 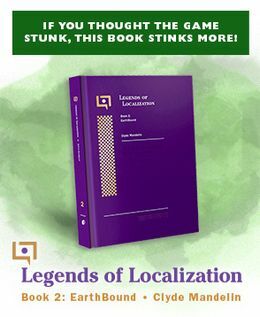 Then, the project was cancelled, and they started to work on a Mother 2 localization. Then, for the English name of Mother 2, they used a slightly different title than the one they were going to give Mother 1, by simply removing the spacing between the Earth and the Bound, so that the name could be the same yet different as what they were gonna call its predecessor. Hey Mato, I just found this post and I wanted to make a few facts clear. It wasn’t “a bunch of EarthBound fans,” it was me who started the thread, and pointed out most of these trademark oddities at Starmen.net. It was another forum-user by the name of Kevin who elaborated them later in the thread. Just wanted these facts on the records (can’t believe its been seven years already! ).